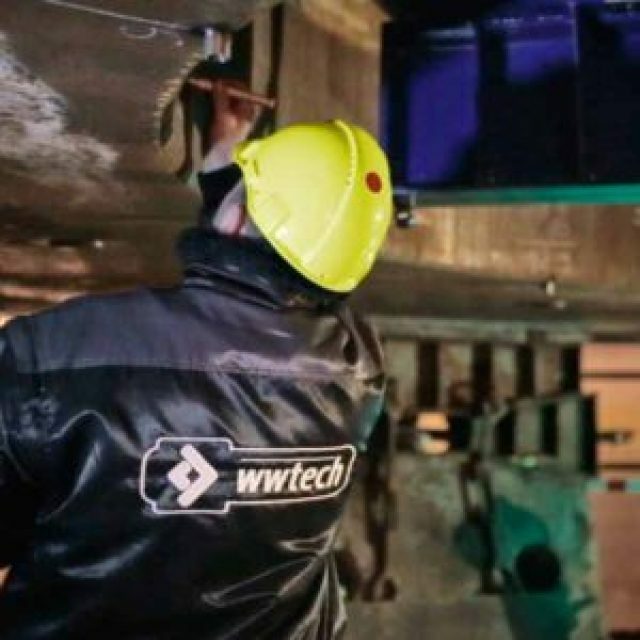 “In-situ” technology by WWTECH company is a reversal of the traditional way of operation, it means the performance of services at the site of daily machine use. It is done with the use of portable machine tools mounted directly on the part that requires repair without the need of disassembly. WWTECH Services is a ambulance of machines and equipment. We operate in the failures and scheduled maintenance. 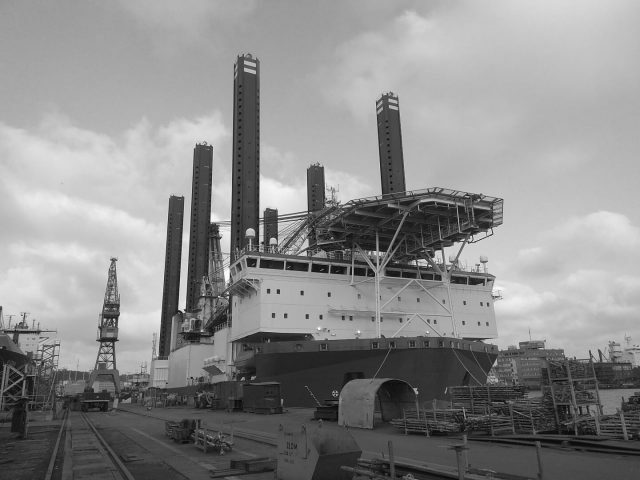 Our technologies, which perform well in the key industrial sectors (energy, chemical, shipbuilding), can successfully be used also for you. 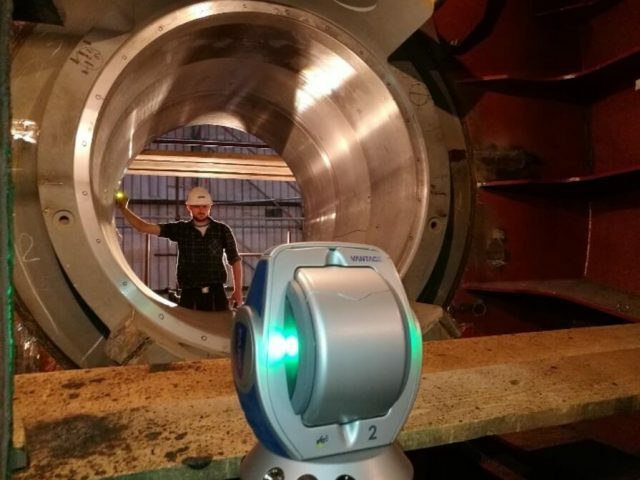 Thanks to accuarate measuring devices FARO (Laser Tracker, Measurement Arm) WWTECH makes it possible to become extremely accurate, fast and non-contact measurements, the results can be analyzed in the real time. 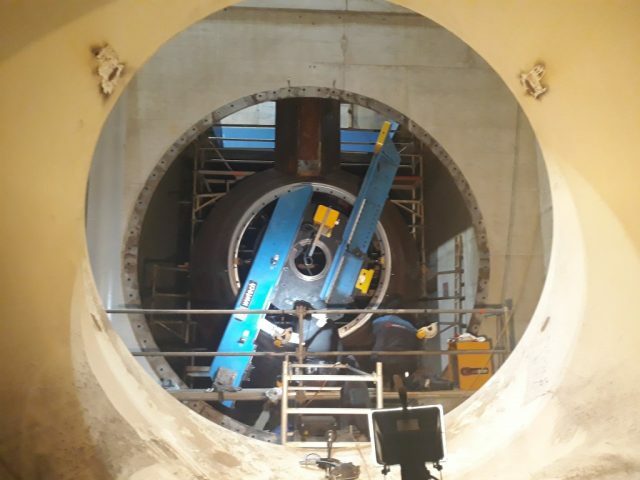 In March 2017, ANDRITZ HYDRO begins supplying electromechanical equipment for a new hydro plant in the heart of Graz, the capital of the Austrian province of Styria. The start-up of the power plant is planned for the first half of 2019. Before the construction is completed, it is necessary to install the power plant equipment: turbines, generators, flaps, various types of drives and control systems. And here is the place for our services. Of course, as in a hydroelectric power plant, the main task is to process large-size flanges. It is a very avant-garde design, which can be seen in the following visualizations: More about the plant: The current state indicates that there is still a lot to be done. As usual, the work begins with accurate measurements. In the foreground, the measurement head of the Laser Tracker device, and the measured object deep in the background, behind the scaffolding. Initial setup of the machine at the workplace. Centering the machine using Laser Tracker. View from the top Machine ready During machining… Finished. 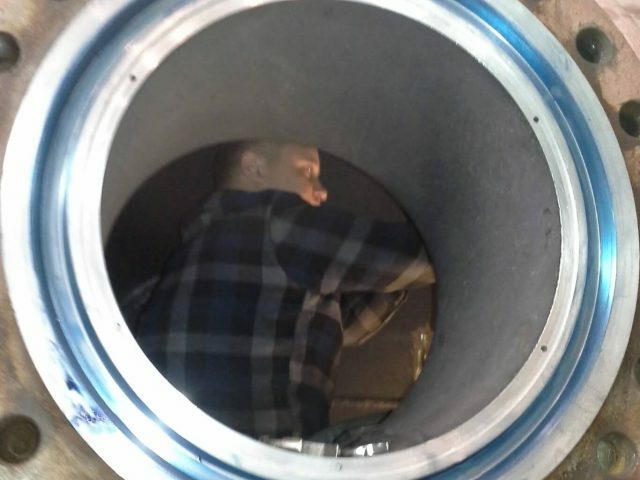 Time to change the configuration – to process a larger flange in the same mounting Continued processing. This time the outer collar Time for a change, we move to a new processing place. Re-installation of the machine. As usual, under the supervision of Laser Tracker ™. Ready. Machine tool ready to work. 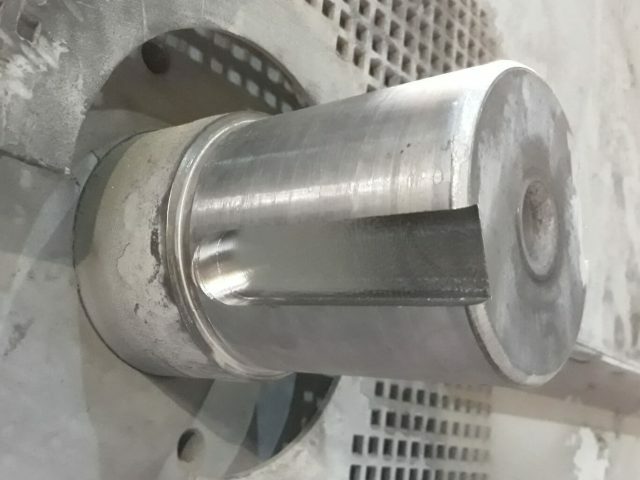 Already during the treatment, it turned out that the surface damages of the workpiece are too deep. The customer decides to fill the cavities with padding. Here is the result. We continue processing Finished. Now a short rest and then the same next – on block 2. Note: the above photojournalism does not contain a description of the complete sequence of activities but only selected stages of work. All activities were performed in accordance with health and safety regulations. Fully functional equipment is fundamental to company’s success. Every machine has precision elements, bearings and number of other parts, that enable its efficient operation. Those main elements, which ensure correct machine operation require specific solutions in case of a breakdown. Leaks, cracks and grooves are issues that have to be eliminated to ensure proper operation. 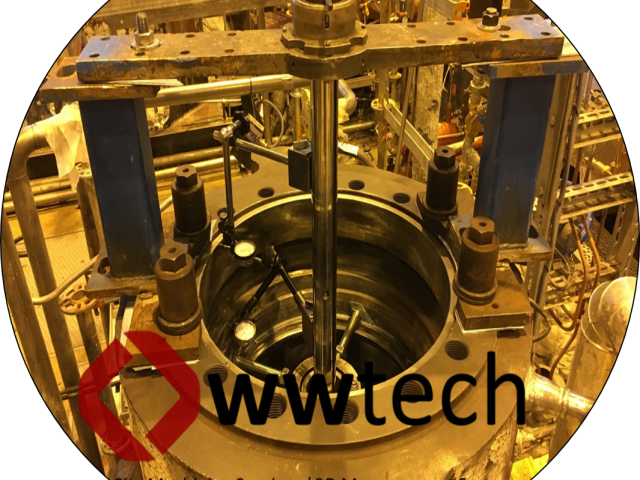 WWTECH Company provides its clients with a complex way of problems resolving, offering them three-dimensional coordinate measurements and a full 3D documentation. Due to accurate measuring devices FARO (Laser Tracker, Measuring Arm) WWTECH makes it is possible to carry out uniquely accurate, fast and non-contact measurements, results of which can be analyzed in a real time. In all undertaken activities WWTECH gives priority to the safety. Our staff’s and the society’s health, respect for the environment are the factors which determine a whole tam activities, a place and other aspects of our work, such as transportation or cooperation with a third party. Our manager contact with you today.